Canadian professional ice hockey player who's known for playing for the Vegas Golden Knights of the National Hockey League. 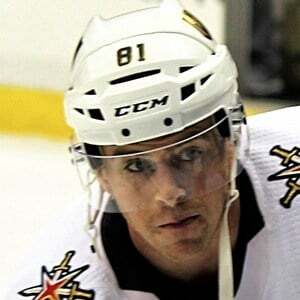 He also played for the Columbus Blue Jackets, Tampa Bay Lightning, and Florida Panthers. He started his junior hockey career with the Quebec Remparts in the Quebec Major Junior Hockey League. He was named Player of the Week in both the QMJHL and Canadian Hockey League in 2010. He married Alexandra Gravel in 2013. The couple has three children, James, Victoria, and Will. Both he and Reilly Smith played for Florida Panthers.